Most calligraphy teachers aren't sure what to do with us lefties and I almost feel guilty when I walk into a classroom and admit that I'm left-handed. In the general population, around 10% of us are left-handed. In calligraphy classrooms, however, we are a rare and troubled group. 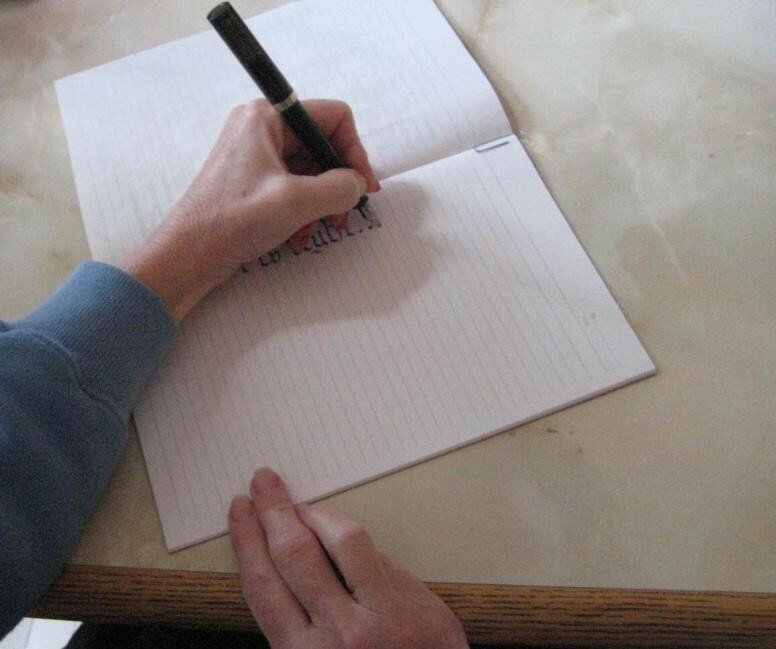 non-curlers write without bending their wrist. First off, I'm a curler. Needless to say, this makes calligraphy quite a challenge. Here's a picture of my awkward hand position (and my liver spots). Usually, following a period of extreme frustration, I resort to dissecting how a right-hander does whatever it is that's plaguing me. When I'm lucky, I come to some kind of understanding and figure out a way to mimic or reinterpret their movements to work for me. After several years of classes, workshops and practice, I've had a few insights I'd like to share. PULL vs. PUSH: Right-handers pull almost every stroke. Curlers attempting the same stroke must push. Pens, like people, don't like to be pushed and they resist. This is especially true of dip nibs as they tend to be quite sharp and dig into the paper if pushed. To compensate, I have learned to draw letters from the bottom up rather than top down. This way, most of my strokes are pulls which makes the pen and me much happier. With a very cooperative pen (like a parallel), I can use the right-handed ductus successfully. However, the strokes are sometimes ragged along the edges due to the resistance of the nib on the paper. I find it's better to be consistent and always draw from bottom to top. SPACING: In the photo above, it's clear that I can't see what I've just written. This makes it difficult to figure out where the next letter should start. Solving this problem has not been easy. A combination of craning my neck, using small target marks to give me placement clues and developing an eye-feel for spacing help somewhat. 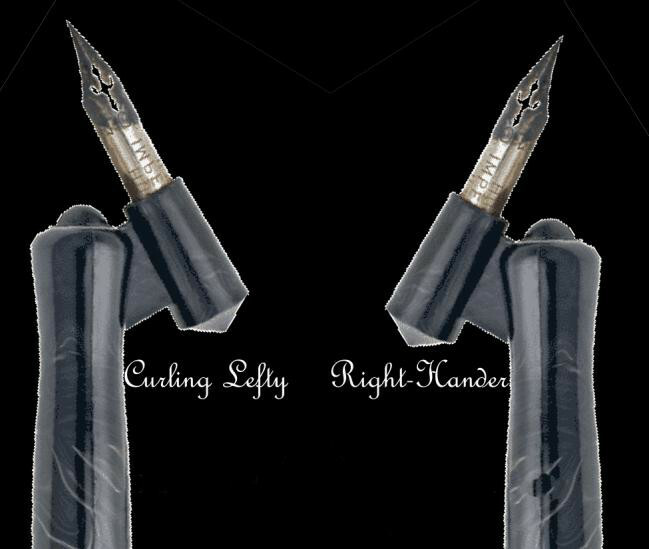 This problem continues to plague me, but then I hear it's not so easy for right-handers either. 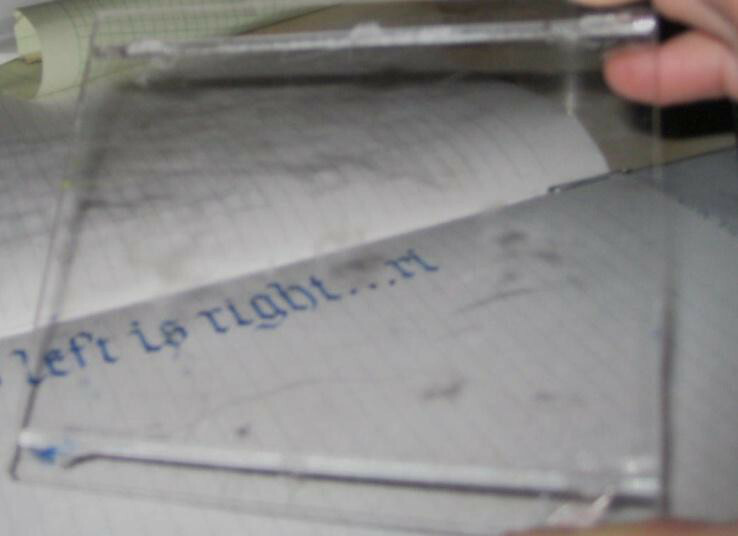 SMEARING: Again, the first picture shows that the likelihood of smeared ink is right around 100%. I've cobbled together a small platform that helps. (Figure 2). It's clear acrylic with tiny rods glued to the bottom. I rest my hand on it so I can slide over wet ink without bathing in it. Most of the time, however, I just write very sloooowy, so the ink dries before I can smear it. ARM MOVEMENT: Right now I'm studying Black Letter for the first time. Marian Gault, our instructor, believes it's one of the easier hands to learn. Making the straight lines that are fundamental to Black Letter has proven to be nearly impossible for me and this makes me very grumpy. Correct arm movement is key; it's also very difficult. Using the forearm rather than fingers and wrist gives a much straighter line. I rest my forearm on the desk and press my elbow downward so my forearm can more easily pivot. It takes soooo much concentration to do this consistently. Practice, practice, practice! MUSCLE MOVEMENT and STRAIGHT LINES: Because I pull my strokes up from the bottom, I use different muscles than right-handers. I suspect the muscles that control upward pulls are not often asked to make straight lines so they aren't accustomed to it. Again, practice is probably the way to train them. If not, I'll stick to round wiggly hands and avoid straight lines altogether. NIBS: I started broad-edge calligraphy using a fountain pen. It's probably good I did or I might have given up after the first lesson. Fountain pens are not as sharp as dip nibs and are more forgiving of push strokes. Until I figured out pushing vs. pulling, I did a LOT of pushing! Now that I understand how a nib is meant to work, I'm able to use some dip nibs. The Hiro/Tape nibs (right-handed) are the best I've found so far. They aren't as sharp as the Speedball “C” series and don't mind being held upside-down (see hand position photo again). Mitchell nibs don't want to cooperate at all! Parallel pens are especially adept at making push strokes, so it may be helpful to have beginners start with them. POINTED PEN: The first obstacle to overcome is getting an oblique holder that works for a curler. The best I have found is the cheapo Speedball because the nib holder (oblique arm piece) is circular and the nib can be inserted anywhere within the circle. Curlers flip the holder such that the oblique piece is to their right (for right-handers, it's to the left)—see photo below. This arrangement allows curlers to use the same ductus as right- handers. However, because of the curled position of the hand, it's very difficult to position the nib on the paper so both tines get equal pressure. I've resigned myself to wearing out nibs unevenly and just doing the best I can! It's that or no pointed pen and who can resist Copperplate, Spencerian and all the pointed pen variations of italic, uncial, etc.? Here is a list of left-handed calligraphy reference books I've found helpful. They contain more information than any beginner could possibly digest, so reading and re-reading as I gain more experience is a good way to pick up tips and tricks. Calligraphy is difficult enough without the added burden of being left-handed. However, some of us enjoy the struggle and are stubborn enough to keep at it. Thanks for taking the time to read this, if nothing else, you'll understand why you're unlikely to find yourself sitting next to a lefty in a calligraphy class! !